A feast for both eyes and palate, the artisanal Ruffoni Opus Cupra 5-1/4-Quart Covered Braiser unites culinary performance with the historic tradition of Italian copper craftsmanship for the ultimate gourmet cookware. For generations to come, the richly-textured, hand-hammered copper exterior of Opus Cupra will enhance the aesthetic of any home and kitchen while providing epicurean excellence. This heirloom-quality piece delivers impeccable performance by means of a copper-wrapped aluminum core for extraordinary heat conduction and a bonded stainless steel interior to assure durability and effortless cleanup. It?s perfectly poised to help prepare and deliver incomparable gastronomic experiences, such as succulent duck legs braised in red wine with roasted pears and onions. With a beautifully-sculpted, mirror-finished cast stainless steel with stamped copper signets, the braiser is appointed with similarly adorned handles. 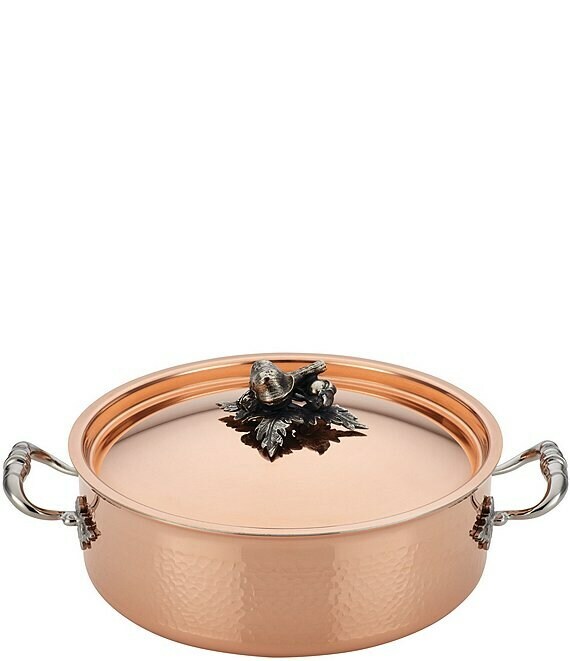 Oven safe to 450°F and suitable for all cooktops, except induction, this deluxe Ruffoni copper braiser is a beautiful addition to a home collection of Opus and Mini cookware to be treasured for a lifetime. Enrich culinary experiences of all kinds, with flavorful braised meals created in the classically designed Ruffoni Opus Cupra 5-1/4-Quart Covered Braiser.